The next camera from Nikon could be the rumored Nikon D6 full frame flagship DSLR camera. Previous rumors said that D6 will be announced sometime in 2019. Now according to NR, it seems that development announcement for Nikon D6 could be as early as at CES 2019 in the beginning of January. Nikon has already registered a new camera code N1811 in Russian. 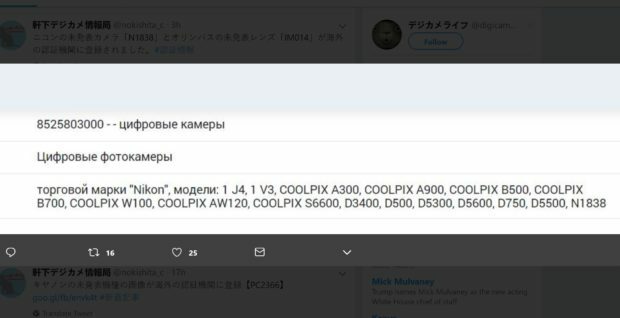 Two new cameras now shows up at Russian certification bodies. One is Nikon N1811, could be upcoming Nikon D760 or D6, the other is Olympus IM010, could be upcoming Olympus OM-D E-M1X. Author CameraeggPosted on October 27, 2018 Categories Nikon D6, Nikon D760, Olympus CameraTags Nikon Rumors, Olympus Camera Rumors, Olympus OM-D E-M1S, Olympus OM-D E-M1XLeave a comment on Nikon N1811 & Olympus IM010 Cameras Got Registered !